Also known as the Argentinian Mastiff, the Dogo Argentino is a large, brave and muscular breed. A capable hunter and guardian, the Dogo is often expected to work for a living, although some people also keep them as family pets. However, given the breed’s strong-willed and confident nature, these dogs are typically best-suited for experienced owners. 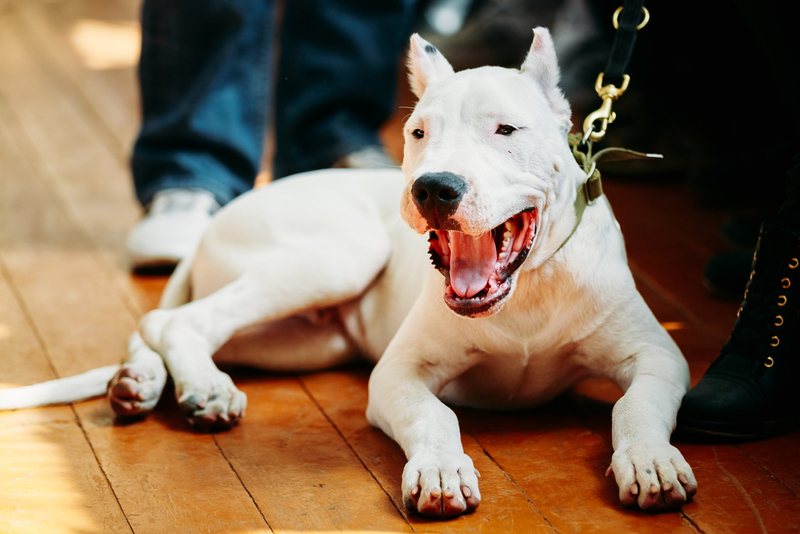 We’ll explain everything you need to know about the Dogo Argentino below, so you can determine if one of these beautiful dogs would make a good fit for your family. 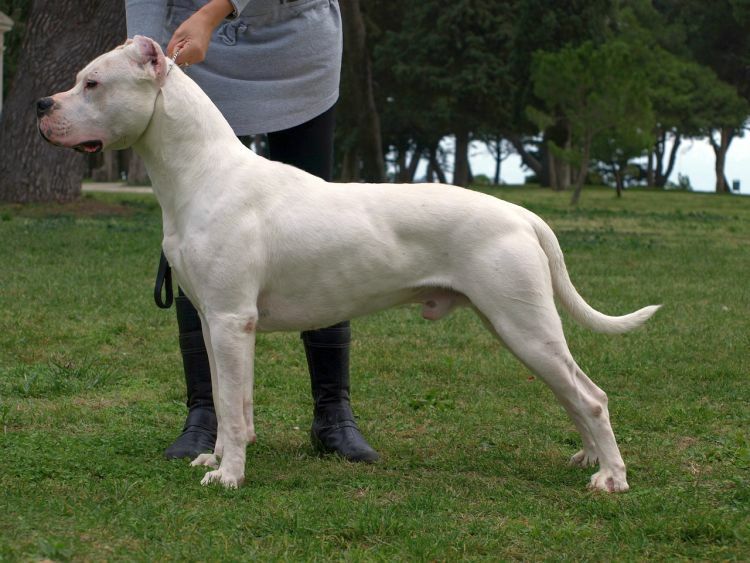 The Dogo Argentino was first developed in central Argentina by Dr. Antonio Nores Martinez. Dr. Martinez began creating the breed in the late 1920s, by combining a variety of different breeds, including the now-extinct Cordoba fighting dog. It appears that the dogs were initially considered a fighting breed, but thanks to his love of hunting in the Argentinian wilderness, Dr. Martinez soon began bringing his new dogs along. The breed proved very well-suited for the task, as they were strong enough to subdue large prey and durable enough to withstand the challenges the rugged landscape presented. Note that the Dogo wasn’t used to hunt for just any prey. They weren’t tasked with retrieving downed birds like Labrador retrievers or eliminating rabbits from subterranean tunnels like dachshunds. Instead, Dogos were expected with finding and catching very formidable animals, including puma and wild boar. The Dogo Argentino began making its way around the world in the following decades. They gained recognition by the Fédération Cynologique Internationale (FLC) in 1973, but they are still not an AKC-registered breed. Dogo Argentinos are big, thick and imposing dogs, who create quite an impression on those they encounter. Small individuals (particularly females) may only weigh 80 pounds or so, but most individuals weigh between 90 and 100 pounds. They stand a few inches over 2 feet tall at the shoulder, and they’re built like a solid block of muscle. The Dogo’s blocky head and broad shoulders help to make them appear even larger and more formidable than some other dogs of similar size. However, Dogos tend to demonstrate the kind of independence that is characteristic of many hunting breeds, rather than the Velcro-like personalities many guarding breeds exhibit. In fact, they are usually more tolerant of being left alone than guarding breeds too. 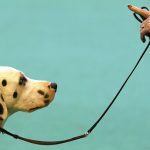 They are relatively smart, but they can be challenging for inexperienced owners to train. Dogo Argentinos are also quite territorial and protective. This can present additional challenges for owners when trying to take their dog out in public or hosting visitors. Dogos tend to remain suspicious of visitors for some time, and, while they are usually gentle with their own family’s children, special care is necessary when introducing them to non-familiar kids. Like many other hunting breeds, Dogo Argentinos have a very high prey drive. They’ll rarely learn to cohabitate peacefully alongside small pets, although they may get along well with other dogs of similar size (after all, early Argentinian hunters used packs of Dogos when hunting). Dogo Argentinos are generally healthy dogs, but like all other breeds, there are a few health issues that seem to afflict them more than others. One of the most common ailments that afflict the breed (approximately 10 percent of all individuals) is pigment-related deafness. This is a condition that is genetically linked to white fur color in some breeds. But while the ailment is obviously unfortunate for dogs afflicted with it, most still manage to live long, full, happy lives. 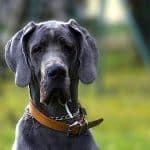 Hypothyroidism, a condition in which a dog’s thyroid fails to maintain a proper thyroid hormone level, is also somewhat common for the breed. However, this can be managed with medications. Also, like most other large breeds, Dogo Argentinos are susceptible to things like obesity, hip dysplasia and bloat. In most respects, caring for a Dogo Argentino is similar to caring for any other breed. We’ll explain their basic dietary, exercise, training and grooming needs below. Dogo Argentinos don’t have any unusual requirements with respect to their diet. Most will thrive on just about any nutritious, high-quality dog food that is specifically formulated for large breeds. 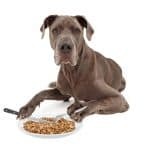 We’ve reviewed several of the best dog foods for large breeds before, so be sure to check out our breakdown of the best options. Additionally, like most other large breeds, Dogos will likely benefit from foods that are fortified with a few key supplements. This includes omega-3 fatty acids, glucosamine and chondroitin, and probiotics. Omega-3s support skin and joint health, while glucosamine and chondroitin help protect your dog’s joints further. Probiotics, on the other hand, are beneficial bacteria that help to promote proper elimination habits. Also, given their susceptibility to bloat, it is often wise to feed Dogos (and other large breeds) small meals, spread throughout the day, rather than a single large meal. You may also want to invest in a feeding bowl that is designed to prevent your dog from eating too quickly. Dogo Argentinos have relatively high energy levels and they need plenty of opportunities to run around and play. After all, part of the reason they were such successful hunting dogs – they could trail prey for hours at a time. Accordingly, you’ll need to be ready to not only take your Dogo on regular walks for bathroom purposes, but you’ll also need to head out into the backyard (or your local dog park) at least once a day. Some Dogos will fetch a thrown ball, while others will simply enjoy running around or playing tag with their owner. By providing your Dogo Argentino with plenty of exercise, you’ll help keep him happy and prevent him from developing destructive behaviors. One more thing: Make sure you provide your Dogo with a few super-durable chew toys. They have strong jaws and a strong chewing instinct, so you’ll definitely want to make sure your pet chews on toys rather than your walls and furniture. 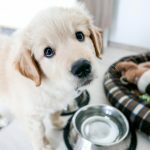 You can and should start house-training your new puppy immediately, but you’ll want to wait for about 7 or 8 weeks to begin basic obedience training. Be sure that you obtain a secure crate, as this will not only give your pet a safe place to sleep, but it’ll make the house-training process easier too. It’s also important to begin socializing your pet by introducing him to as many people as you can, and start introducing him to other dogs as soon as your vet gives you the green light to do so. Note that Dogo Argentinos are not the people-pleasers that some other breeds are, and they can be very challenging to train at times. If you find that the training process is not proceeding as you’d hoped, don’t hesitate to solicit the help of a professional trainer. SEE ALSO: A Review of Dog Shock Collars: An Effective Training Tool? Dogo Argentinos have very low-maintenance coats and they don’t require any special grooming practices. Bathe your Dogo regularly (perhaps once per month or so), and keep his nails trimmed and teeth brushed. Dogos don’t shed very heavily at all, which makes them a good choice for owners who struggle with allergies. However, you can reduce the amount of hair they leave in your home even further by brushing them regularly. In fact, many Dogos (as well as members of other breeds) enjoy being brushed, so it can serve as a bonding experience too. Dogo Argentinos aren’t very common dogs, so you may need to hunt around a bit to find one of your own. You can try searching the AKC’s Puppy Marketplace if you’d like to purchase one from a breeder, or you can look into DC Dogos, a rescue organization that specializes in the breed. But no matter where you decide to obtain your new pet from, you must exercise great care. 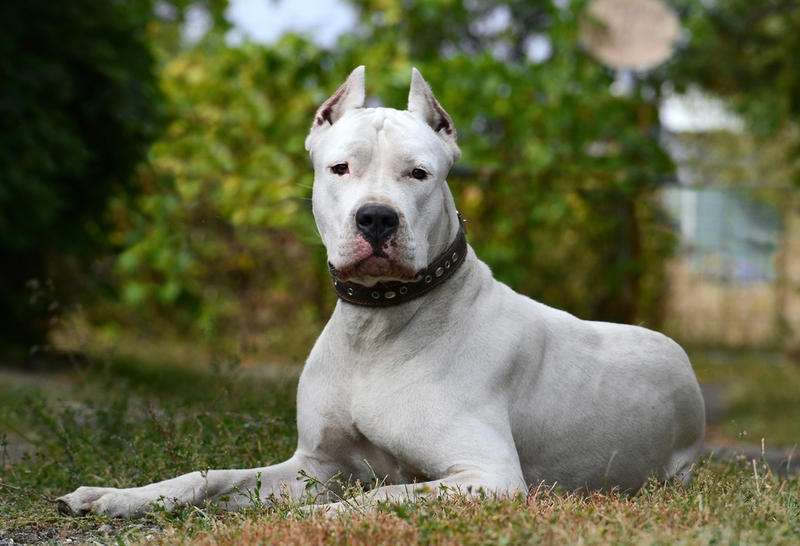 Given the Dogo Argentino’s size, strength and no-nonsense attitude, it’s imperative that you obtain your new pet from a responsible and ethical breeder or rescue organization. This will help ensure you don’t end up with a dog who has a problematic disposition. 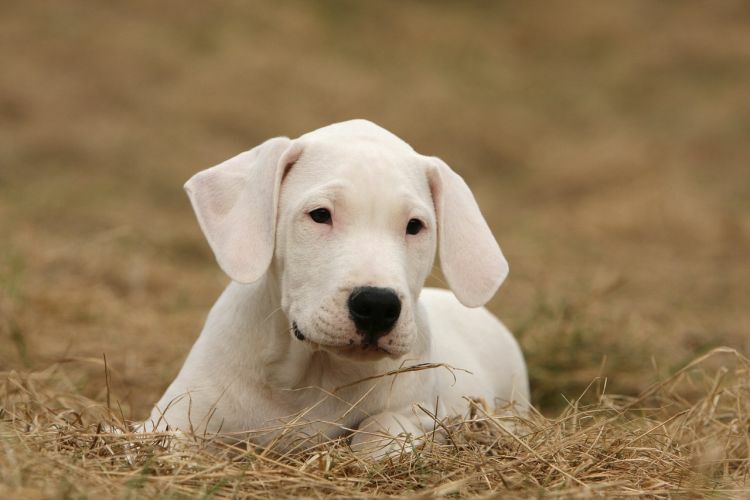 Most people who are planning on getting a new dog have questions, but this is especially true of those who are interested in rare breeds, such as the Dogo Argentino. We’ll try to help below, by answering some of the most common questions about the breed. 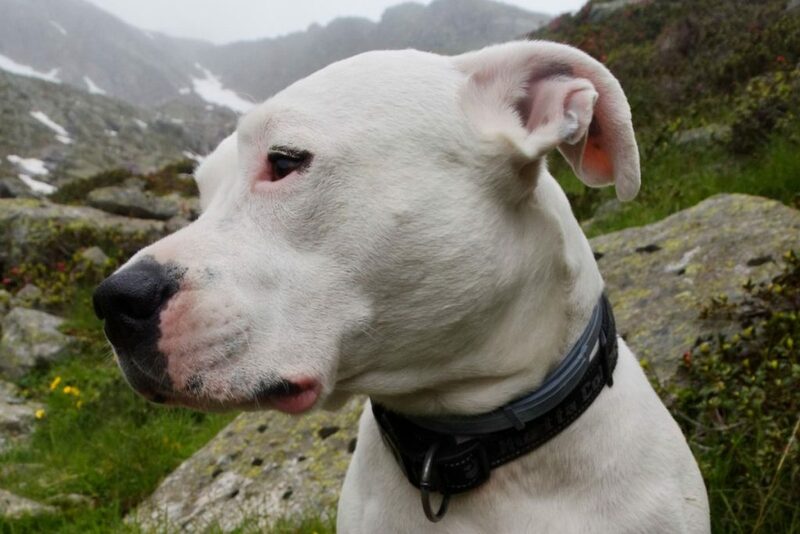 Currently, residents are prohibited from owning Dogo Argentinos in several countries. They aren’t illegal in the United States at the federal level, but several cities and municipalities ban the breed entirely. Accordingly, you’ll want to make sure that you investigate the laws in your area before you buy or adopt a Dogo Argentino of your own. No breed is inherently dangerous, and well-trained and socialized Dogo Argentinos can make very loving, gentle pets. However, given their strength and size, it is imperative that you obtain these dogs from a reputable source and work with a trainer if you have any difficulty socializing your pet. No dog is truly hypoallergenic – they all shed proteins that can trigger allergic individuals. However, short-haired dogs who shed relatively little are often good options for people with dog allergies. Will Dogo Argentinos get along with other dogs or cats? Dogo Argentinos have high prey drives, so they are not ideal for homes with cats. They’ll often get along well with other large dogs, but caution is necessary when introducing them to smaller canines. In all cases, it is important to begin socializing your Dogo at a young age to help make interactions with other animals as safe as possible. Are Dogo Argentinos good with children? Dogo Argentinos are often incredibly good companions for family children. They can be a bit rough and playful while young, but they often become very protective of their pack members as they age. Nevertheless, caution is warranted whenever introducing Dogo Argentinos to unfamiliar youngsters. Wrapping Up: Is the Dogo Argentino Right for You? Dogo Argentinos are wonderful dogs, who have a number of very desirable traits. They’re not only loving and protective dogs, but they’re also beautiful and quite impressive looking. 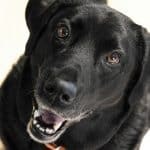 They are also a breed that you won’t see all the time – which is often appealing to owners who want a dog that stands out from the myriad Labs, golden retrievers, huskies and German shepherds running around at most dog parks. Dogos are usually healthy dogs, who don’t suffer from very many health problems, and while they do require a lot of exercise, they don’t have the inexhaustible energy levels of some other breeds. However, Dogo Argentinos are serious dogs, who demand respect. They are not a good choice for owners who do not want to invest the time and energy needed to train them, and their independent nature makes them a poor choice for first-time owners.